Your short-term cash flow typically includes any money your business earns or pays out in the course of its daily operations. And since your profits are directly tied to the difference between the dollars flowing in and the dollars flowing out, you’ll naturally want to take steps to ensure you’re bringing in significantly more than you’re spending! Many small businesses use financial tools like company credit cards and lines of credit (LOCs) to manage their short-term cash flow – especially new companies that are still trying to get established. Quick, pre-approved cash sources like these can be invaluable for keeping bills and employees paid in full and on time. But loans and charge cards tend to come with interest payments and other strings attached, so they’re not necessarily the answer to every cash crunch situation. Sometimes it takes a more creative approach to find the solution that best fits your business. If you’re looking for a quick way to bump up your income, start with the products and services you sell. Many of your customers will find it hard to resist a deal – especially one that’s available for a limited time only. Consider offering clients deep discounts, two-for-one sales, or “buy this item, get that one half-price” specials. Just be sure you contact your regular customers in advance to let them know about the great bargains you’ve got planned. And don’t forget to tell them to bring a friend along! If you’re really in a cash bind, you could also consider selling off some of your receivables to a factoring company in exchange for a percentage of their value. Some small businesses make the mistake of tying too much of their cash up in inventory holdings. At the same time, it’s not uncommon for certain products to become obsolete, out of style, or even slightly damaged while they sit on your shelves and wait to be sold. Rather than simply hoping you’ll turn those goods into income by selling them in the usual way, you could try unloading them on a discount or “seconds” retailer or wholesaler for a reduced price. 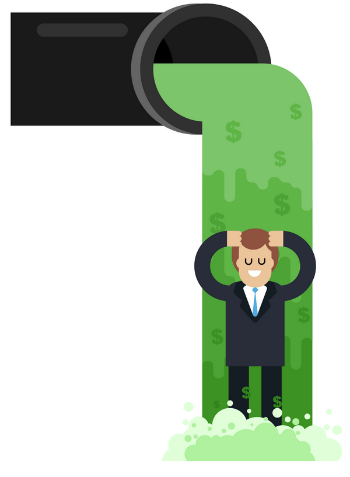 You might not make as much money doing this – and might even have to sell at a loss – but purging excess or unsellable product can mean a nice injection of cash into your company coffers. It only makes sense that the longer you put off paying your bills, the longer you’ll hang onto your cash. But the problem with this approach to dealing with debt is that it’s a slippery slope down to interest charges, penalty fees - and damaged relations with important suppliers. Success in either one of these areas will help keep your cash flow a little more positive - without damaging your professional reputation. One of the most creative (although usually irreversible) ways to temporarily increase cash flow is to sell off something your company owns - and rent or lease it instead. This could involve a big step like selling property to a buyer who’s then willing to turn around and lease it back to your business. But it can also be as simple as disposing of a piece of equipment your company doesn’t use much, and renting it on an as-needed basis. Either way, the money you’ll earn from the sale of such an asset is sure to provide a welcome lump sum of cash.